Financial development is important for economic growth, but it is unclear how the growth of finance has aﬀected productivity in the economy at large. This note starts by reviewing the evidence on productivity growth in the finance industry. Financial services remain expensive and financial innovations have not delivered significant benefits to consumers. Finance does innovate, of course, but its innovations are often motivated by rent seeking and because entry and competition in many areas of finance have been limited. A theme that emerges from the analysis is that it is important to distinguish between the early and late stages of financial deepening. The evidence suggests that financial deepening is beneficial in emerging economies. It fosters growth and probably reduces inequality. On the other hand, in many advanced economies, financial deepening in the usual sense—an increase in private credit over GDP for instance—is unlikely to bring significant welfare gains, and could even be counter-productive. 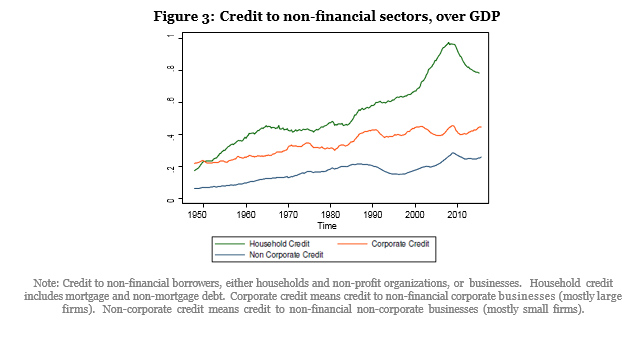 More credit does not predict more growth in advanced economies, and the composition of credit has shifted away from corporate debt towards household debt since the 1980s. At low levels of development, finance is likely to lower inequality. At high levels of development, however, the growth of finance is likely to increase inequality, both directly as top earnings in finance become more extreme, and indirectly through the provision of specialized financial services tailored to rich households. Overall, the shortcomings of the financial sector contribute to the paradox of rapid technological change but slowing productivity growth. There are some reasons to be cautiously optimistic, however, because some recent technological innovations in finance have the potential to improve financial services for a broader share of the population. One can see innovations in payment systems, asset management, and insurance that are not necessarily targeted toward the richest households. Whether or not these innovations fulfill their promises will depend in large part on policy choices and regulations. Philippon (2016) updates my early analysis (Philippon, 2015) on the unit cost of financial intermediation in the U.S. The main finding is that the unit cost has remained around 2 percent for the past 130 years. The calculations are based on a simple model economy consisting of households, a non-financial business sector, and a financial intermediation sector. The details of the model are in Philippon (2015). 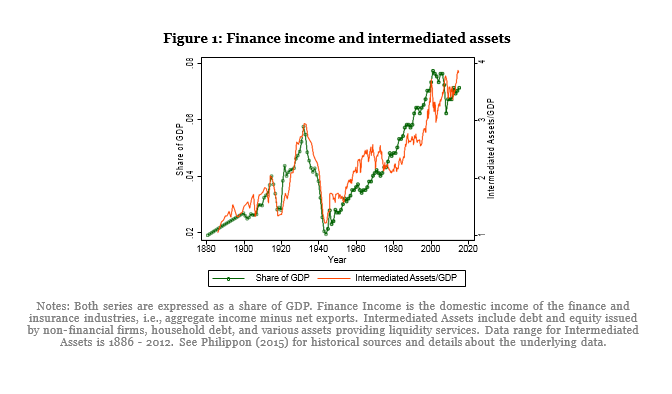 The income share of finance, one of the two series shown in Figure 1, is defined as value added of finance industry over GDP. It measures how much society pays for financial services. I define intermediated assets related to household credit, corporate finance, and liquidity services. I measure the instruments on the balance sheets of non-financial users, households, and non-financial firms. After aggregating the various types of credit, equity issuances, and liquid assets into one measure, I obtain the quantity of financial assets intermediated by the financial sector for the non-financial sector, displayed in Figure 1. Bazot (2013) finds similar unit costs in other major countries (Germany, U.K., France). Improvements in information technologies have not been passed through to the end users of financial services. This section oﬀers an update of this work, with two goals in mind. First, measurement is diﬃcult, and statistical agencies have recently made some significant data revisions to financial accounts. One needs to know if these revisions aﬀect the main insights of the original paper. 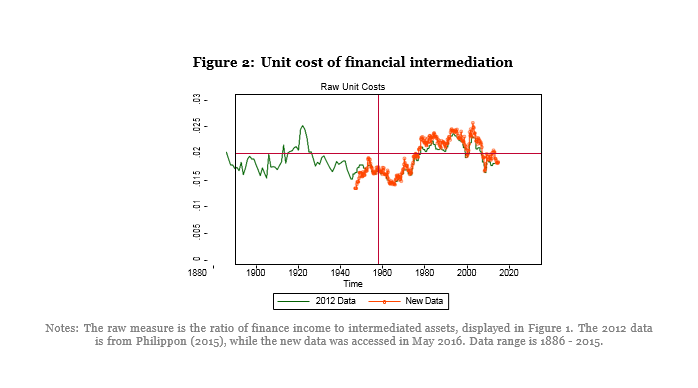 The second reason for updating the series is that the data in Philippon (2015) predates the financial crisis and one would like to know how the unit cost of intermediation has evolved since then. I then discuss recent trend in labor compensation and employment. Finally, I discuss the evidence on the link between finance and growth. I can then divide the income of the finance industry by the quantity of intermediated assets to obtain a measure of the unit cost. Figure 2 shows that this unit cost is around 2 percent and relatively stable over time. In other words, I estimate that it costs 2 cents per year to create and maintain $1 of intermediated financial asset. Equivalently, the annual rate of return of savers is on average 2 percentage points below the funding cost of borrowers. The updated series are similar to the ones in the original paper. The unit costs for other countries are estimated by Bazot (2013) who finds convergence to U.S. levels. The raw measure of Figure 2, however, does not take into account changes in the characteristics of borrowers. (Philippon, 2015, 2016) provide quality adjusted measures and the main point does not change. It is diﬃcult not to see finance as an industry with excessive rents and poor overall eﬃciency. The puzzle is why this has persisted for so long. There are several plausible explanations for this: zero-sum games in trading activities, ineﬃcient regulations, barriers to entry, increasing returns to size, etc. There is a large literature studying the links between finance and growth. Levine (2005) provides an authoritative survey, and Levine (2015) a recent discussion. One main finding is that countries with deeper credit markets in 1960 (measured as credit outstanding over GDP) have grown faster between 1960 and 1995. This relationship, however, is driven by countries at relatively low levels of financial development. Among member countries of the Organization for Economic Cooperation and Development the link between credit and growth is not significant. In other words, once a country has achieved a certain level of financial development, there is no reason to expect that credit expansion leads to more long term growth. As Levine (2005) emphasizes, the primary driver of the finance growth nexus is the allocation of capital. Better financial systems provide a better allocation of capital, not necessarily more overall credit. This is consistent with the findings in Favara (2009) and Cecchetti and Kharroubi (2012) who argue that the relation between credit and growth is not monotonic. This fact is also related to the issue of credit booms. Schularick and Taylor (2012) document the risks involved in rapid credit expansions. These risks include decrease in lending standards (including outright fraud), over-exposure of the financial sector, and macro-economic imbalances, and all played an important role in the recent financial crisis. This is not to say that all credit booms are bad. Dell’Ariccia et al. (2016) find only one-third of credit booms end in a financial crisis, while many booms are associated with financial reform and economic growth. Perhaps the most important change in credit markets over the last decades is the evolution of the mix between firms and households. Figure 3 shows that most of the growth in credit markets since 1980 has occurred in household credit, most of it linked to real estate. There are two potential issues with this trend. First, land being in fixed supply, an increase in mortgage credit is likely to lead to an increase in land prices, and to a lesser extent to an increase in the quantity of housing. Credit-driven house price inflation is a waste of real resources (that go into making and packaging the loans), which does not improve welfare and can increase the risk of financial crises. The second issue is that household credit can crowd out firms credit, either via the real interest rate (in a closed economy) or via the cost of intermediation. As Beck et al. (2008) show, “the share of household credit in total credit increases as countries grow richer.” In cross-country regressions, however, it is only firm credit that predicts improvements in GDP per capita, but not household credit. This can partly show why financial development does not predict higher growth among high-income countries. It also begs the question of whether the composition of credit is eﬃcient, and if financial intermediation contributes enough to productivity growth. Philippon and Reshef (2012) document the evolution of the relative wage in the finance industry defined as the ratio of the average wage in finance to the average wage in the private sector (total compensation divided by total number of employees). This measure does not control for changes in the composition of the labor force within a sector (see Philippon and Reshef (2012) for micro evidence on this issue). 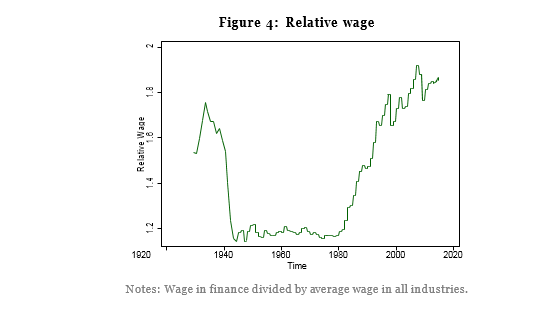 Figure 4 shows high relative wages in finance in the 1920s, a sharp drop following the Great Depression and World War II, and then a period a remarkably stability, from 1945 to 1980. After 1980 the relative wage starts increasing again, in part because low skill jobs are automated (ATMs) and in part because the finance industry hires more brains. We can see some relative wage moderation following the 2007/2009 crisis but it is clearly limited. The labor share in finance has increased a bit relative to the rest of the private sector (i.e., the profit share has fallen a bit more in finance), suggesting that some more moderation in the future, but the changes are not large. The relationship between finance and inequality is complex, and to some extent mirrors that of credit expansion and growth. In less developed economies, finance is likely to expand opportunities and reduce inequality, as argued by Demirguc-Kunt and Levine (2009). On the other hand, high wages in finance mechanically lead to an increase in inequality. Bakija et al. (2012) find that finance professionals account for a quarter of the increase in the share of national income going to the top 1 percent of the income distribution between 1979 and 2005. Another way in which finance can lead to an increase in inequality is by oﬀering higher returns on products that are only accessible to wealthy households. This leads to inequality in the returns on wealth. In data from Norway, Fagereng et al. (2016) find that households in the 90th percentile of the wealth distribution have median returns that are often twice as large as those of households in the 10th percentile. That gap is likely to be higher in the U.S., where the supply of specialized funds for rich households is larger and more advanced, but more evidence is needed to quantify these eﬀects. There are many new things in finance, and there are many valuable things in finance. Unfortunately, most of the time, what is valuable is not new, and what is new is not valuable. Advances in technology have not yet led to broad improvements in financial services. The main reason is that technological improvements have been concentrated in areas of finance, such as trading, that are unlikely to have a first order impact on welfare. This, however, might be changing and there is some reason to be cautiously optimistic. Financial technology, popularly known as fintech, covers digital innovations and technology-enabled business model innovations in the financial sector. Such innovations can disrupt existing structures and blur industry boundaries, facilitate strategic disintermediation, revolutionize how existing firms create and deliver products and services, provide new gateways for entrepreneurship, and democratize access to financial services—but also create significant privacy, regulatory, and law-enforcement challenges. Examples of innovations that are central to fintech today include cryptocurrencies and blockchain, new digital advisory and trading systems, artificial intelligence and machine learning, peer-to-peer lending, equity crowdfunding, and mobile payment systems. New technologies can improve productivity and lower the unit cost of intermediation, especially in areas where the incumbents are ineﬃcient. In banking, for instance, successive mergers have left many large banks with layers of legacy technologies that are at best partly integrated, as discussed in Kumar (2016). Big banks have the advantage of scale economies, especially in information technology (Kovner et al., 2014), but fintech startups, on the other hand, have the chance to build eﬃcient and integrated systems from the start. Recent innovations are also encouraging because they could improve services for a much larger fraction of the population. An early example concerns remittances, where fees have historically been high and represented a significant tax on relatively poor households. Rysman and Schuh (2016) review the literature on consumer payments more broadly and discuss three recent innovations: mobile payments, real-time payments, and digital currencies. Mobile payments are already popular in Asia and parts of Africa. Real-time payments oﬀer an alternative to cash that can simplify liquidity management and decrease credit risk. Faster systems are often encouraged by central banks. The usefulness of digital currencies remains an open question, but they have the potential to lower the costs of transactions, in particular in retail networks. Asset management and savings products can also benefit from new technologies. There are two main issues with asset management today: high fees and bad advice. Average fees have not declined because, as standard product became cheaper, customers were pushed into higher fee products (Greenwood and Scharfstein, 2013). Moreover, conflicts of interest are pervasive in the industry, leading to poor performance to many households, especially the more vulnerable ones. Technology will certainly lower management fees, and it could also lead to better asset allocations. Karlan et al. (2016) review the research on improvements in financial services for the poor. They emphasize the opportunities from better savings products and better insurance markets, where current business models are too costly for poor households, and where new technologies could have a first order impact on welfare. When it comes to regulating finance, the main policy approach followed around the world is to impose prudential regulations and consumer protection regulations on incumbents. This approach has been strengthened after the financial crisis (see Ingves (2015) and Philippon (2016) for recent discussions). This traditional approach makes a lot of sense, but one should also recognize that it has not delivered much real improvements for the average household. The main negative side eﬀect of the current approach is that it deters entry and competition, and this explains in part the lack of useful innovation in finance. At this stage, I would argue that the traditional approach should aim at preventing the dilution of the rules that have been agreed after the financial crisis, in particular with respect to capital requirements, bail-ins, and resolution. We should recognize, however, that this approach is unlikely to achieve significant structural changes in the finance industry. Strategies for top-down structural reform have been discussed by the Independent Commission on Banking (i.e., the Vickers commission) in the U.K., and the High-level Expert Group (i.e., the Liikanen commission) in the EU. In the U.S., a return to Glass-Steagall was briefly discussed. But at the end of the day, most countries have simply decided to limit proprietary trading and principal investments (i.e., the Volcker rule) and to implement some notion of ring-fencing, often linked to resolution plans. These regulations do not really change the structure of the banking industry. This outcome has frustrated advocates of a more aggressive approach to banking reform, but it is explained by two basic reasons. The first reason is that there is no compelling evidence for any of the proposed structural reforms. Universal banks probably contributed less to the crisis than stand-alone investment banks, so it is not clear what a separation between investment and retail banking would achieve. Similarly, the European banking crisis is linked to standard non-performing loans, not complex trading positions or fancy derivatives. The second reason is that imposing top-down structural changes is extremely diﬃcult and costly, and would require unrealistic foresight and coordination among regulators. This is why I think that the traditional approach should simply seek to consolidate existing eﬀorts and prevent regulatory arbitrage. A complementary approach to financial regulation should therefore be pursued. It should encourage entry and shape the development of new systems, while taking advantage of the ongoing development of fintech firms. This alternative approach has the potential to increase eﬃciency and safety in the long run, but it is likely to create specific regulatory challenges. For instance, regulators need to decide which regulations to apply to new entrants (the “sandbox” approach). This highlights the complex issue of biases in the competition between entrants and incumbents. Ensuring a level playing field is a traditional goal of regulation. Darolles (2016) discusses this idea in the context of fintech and argues, from a microeconomic perspective, that regulators should indeed ensure a level playing field. This line of argument, however, does not readily apply to many of the distortions that plague the finance industry. For instance, what does a level playing field mean when incumbents are too-big-to-fail? Or when they rely excessively on short-term leverage? The level playing field argument applies when entrants are supposed to do the same things as incumbents, only better and/or cheaper. But if the goal is to change some structural features of the industry, then a strict application of the level-playing-field principle could be a hindrance. Monitoring and enforcement will also need to evolve. For instance, robo advising will certainly create new legal and operational issues. The U.S. Securities and Exchange Commission and Financial Industry Regulatory Authority issued an alert in May 2015 to provide investors with a general overview of automated investment tools. It provides tips to investors to help them understand the pros and cons of robo advising. It is plainly obvious that we will need a lot of learning-by-doing before we have a satisfactory robo-advising system. But, the key point to remember is that robo advisors do not need to be perfect, especially not from the start. They only need to be better than human advisors, who have a rather poor track record, as discussed earlier. Another important point here is that regulations are likely to be more eﬀective if they are put in place early, when the industry is still young. For instance, regulators could have decided in the 1970s that, as a matter of principle, all mutual funds should use a floating net asset value. Had that regulation been proposed, it would have been relatively straightforward to implement at the time, and it would have permanently decreased the risk of runs, such as the ones we saw after the failure of Lehman Brothers. It is significantly more diﬃcult to implement today, however, when the industry has trillions of dollars under management. Regulators should therefore mandate now some of the basic features they would like to see in the long run. It requires the regulators to be more forward looking, but in a limited way. They certainly do not need to forecast the shape of the industry or what the future technologies will be (no one can). The good news is that the basic regulatory principles for an eﬃcient finance industry are rather clear and stable over time: transparency, open access, limited leverage, and limited maturity transformation. This alternative approach does not seek to impose top-down structural changes. It uses strategically the ongoing development of fintech firms. One can achieve bottom-up structural change, for instance, by encouraging firms that provide transaction services that are cheap, transparent, and open access. Despite significant challenges in the short run, it holds the promise of meaningful improvements in the safety and eﬃciency of financial services in the long run.